After taking home the award for Best Large Car in the Automobile Journalist Association of Canada’s annual Car and Truck of the Year program in January, beating the refreshed Mazda6 and thoroughly redesigned Toyota Camry in the process, the Accord has now been named 2018 Canadian Car of the Year. 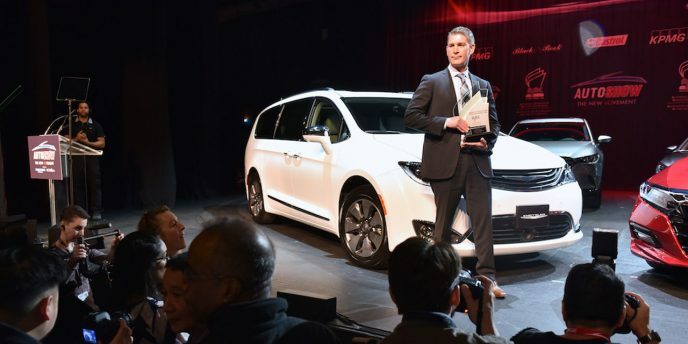 Likewise, after besting the entirely new Honda Odyssey and Kia Sedona minivans the all-new 2018 Chrysler Pacifica has earned Canadian Utility Vehicle of the Year. The latter award might be the more important of the two, being that trucks, SUVs and vans now make up the majority of new vehicle sales in Canada. 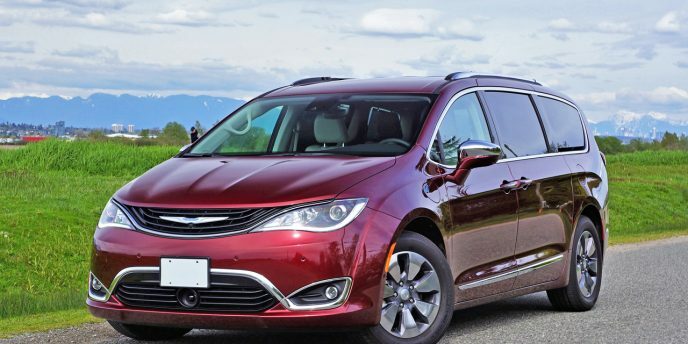 Of note, the Canadian-made Pacifica not only beat out its “Best Minivan” category competitors to earn the coveted award, but also scored higher than other category winners. These include the Mazda CX-5, which beat the new Honda CR-V and Nissan Rogue for “Best Small Utility Vehicle,” as well as the Mazda CX-9 that overcame the challenge of Chevrolet’s Traverse and Toyota’s Highlander for “Best Large Utility Vehicle,” plus the Range Rover Velar that earned “Best Small Premium Utility Vehicle” over the Porsche Macan and Volvo XC60, the Acura MDX that earned “Best Large Premium Utility Vehicle” over the Land Rover Discovery and Volvo XC90, and finally the Ram 1500 that won “Best Pickup Truck” over the new Honda Ridgeline and refreshed Toyota Tacoma. The redesigned Accord also had its share of challengers, including the Volkswagen e-Golf that achieved “Best City Car” over the Hyundai Ioniq Electric and Nissan Micra, Mazda3 that earned “Best Small Car” over the Chevrolet Bolt EV and Hyundai Ioniq Hybrid/Electric Plus, Jaguar XE that took “Best Small Premium Car” honours over the Alfa Romeo Giulia and Infiniti Q60, Volvo S90/V90 that overcame the Genesis G80 and Lexus LC to win the “Best Large Premium Car” title, Volkswagen Golf R that won “Best Sports/Performance Car” over the Honda Civic Si and Honda Civic Type R, Jaguar F-Type that achieved “Best Premium Sports/Performance Car” over the Porsche 718 and Porsche 911, and finally the Mercedes-Benz SL that won “Best Convertible” over the Mazda MX-5 and Porsche 718 Boxster. To qualify for entry a vehicle must be entirely new or significantly updated, and the winners were not only up against the challengers noted, but other offerings that didn’t make the “finalists” cut in December. It’s only fitting that Canada’s favourite family shuttle was the official conveyance in our capital city for our 150th confederation celebrations. 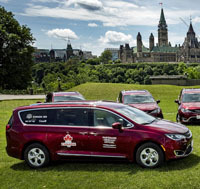 Fiat Chrysler Automobile’s ultra-popular Dodge Grand Caravan, dearly departing Chrysler Town & Country, and advanced new Chrysler Pacifica minivans combine for unsurpassed annual seven- to eight-passenger vehicle sales, having found almost twice as many Canadian buyers as all other minivans combined in calendar year 2016. In fact, if commercial vehicle sales were taken out of the overall equation, FCA’s minivans would have accounted for more business than almost any other vehicle line in Canada last year. 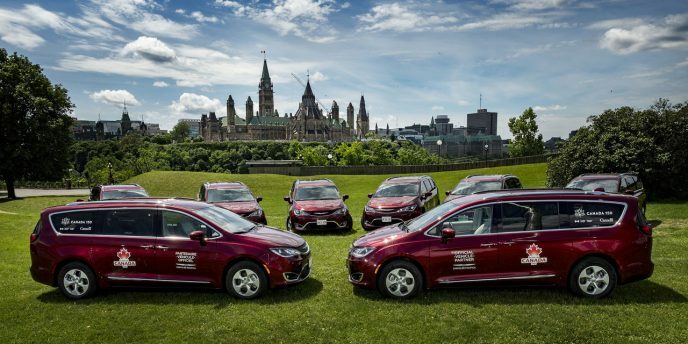 Canada’s most popular Ford F-150 and runner-up Honda Civic might have been appropriate official Canada Day 2017 vehicles for our July 1st weekend celebrations too, but for the purpose of conveying visitors around Ottawa, the fleet of 26 seven-seat Velvet Red Pearl-painted and “Canada 150” maple leaf decaled Chrysler Pacificas were much more useful. 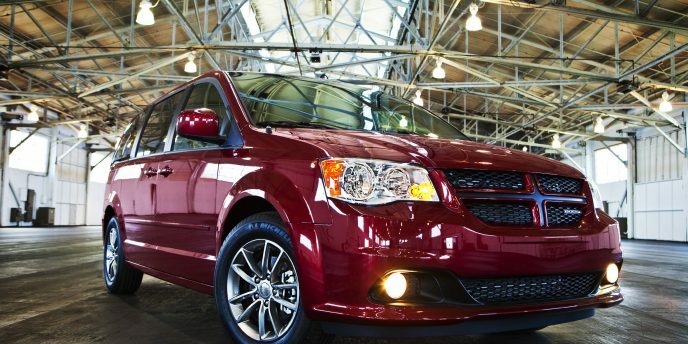 It didn’t hurt matters that these vans were produced in FCA’s Windsor Assembly Plant in Windsor, Ontario; the result of 6,000 hourly workers on three full shifts. The Windsor facility builds both the conventionally powered Pacifica as well as the Pacifica Hybrid, the former featuring the brand’s class-exclusive second-row “Stow ‘n Go” seating that fold completely into the floor when more cargo space is required, while the latter includes a plug-in hybrid electric powertrain capable of 53 kilometres of pure EV range, up to 911 kilometres of total range, and a five-cycle Transport Canada claimed fuel economy rating of 2.6 Le/100km in the city. During the Canada Day weekend, Ottawa hosted a three-day festival in three venues including Parliament Hill, the Canadian Museum of History, and Major’s Hill Park. Along with the fleet of vans shuttling event-goers from attraction to attraction, those in attendance were able to view 30-second video spots as part of the Major’s Hill event, plus FCA branding broadcasted on big screen displays at other event locations. 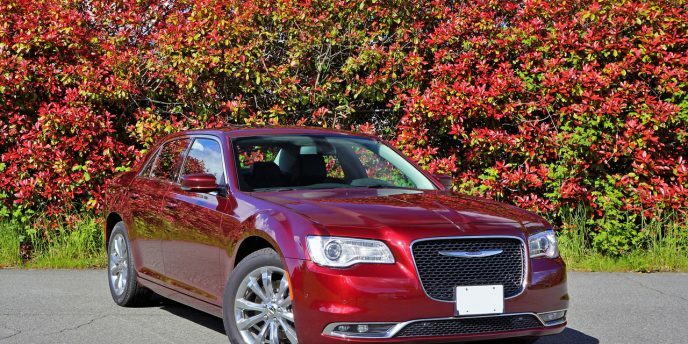 Have you ever noticed just how many Chrysler 300s proliferate our streets? It may not come as a surprise to find out the popular model outsells every mid- and full-size premium-branded luxury sedan in the U.S. and Canada, as well as all mainstream volume branded luxury four-doors, except its badge-engineered Dodge Charger cousin. In the mainstream volume auto sector only Daimler's Smart brand has fewer models than FCA's Chrysler. Chrysler has three. And next year it'll be down to two. Just how FCA allowed this to happen is anyone's guess outside of Auburn Hills, but at least the two models that will carry the Pentastar flag into 2018 are very good at what they do. Case in point, the 300 is the perennial Canadian bestseller in both the mainstream full-size luxury sedan class and the mid-size premium E-segment (it arguably fits into either depending how you load it up). It obviously targets its audience very well. The Pacifica minivan hasn't been so fortunate thus far, and due to the slow take-rate of electrified vehicles this new plug-in variety even less so, but to Chrysler's credit the conventionally-powered model's sales have been growing since a new entry-level trim was introduced, and base pricing concurrently came down.